Today, we are going to visit Berlin and explore an exquisite and modern home. This house exudes sophistication and individuality and you'll be awed by the decor as you explore it. 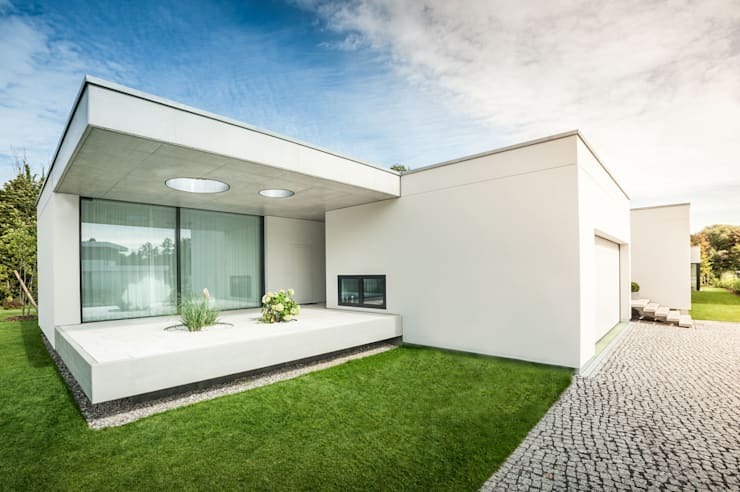 Designed by professionals Sehw Architecture GMBH, this massive 6,400 square foot home was built for a couple and is comprised of five sections. As the architects say: This architectural dream is more like a small settlement than a single house. As we explore this home, you'll see how the pavilion-like buildings float above the ground, connected to each other via a floor disk and a roof plate. Between them, there are secluded terraces, landscape greenery and a swimming pond. 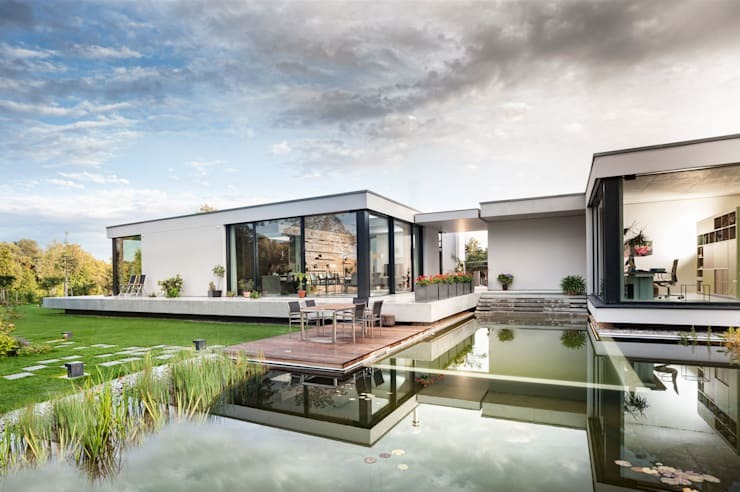 The large glass windows and doors create a very modern and sophisticated finish, while the concrete slabs make for a cool but elegant exterior. Far from stark, natural materials play a pivotal role throughout this stylish home. The architecture is modern, sophisticated and classy. Besides having a flat roof, the home plays with volumes and shapes, resulting in a very unique design. The interior spaces spill out onto a gorgeous garden, terrace and swimming pond. Nature infuses with the sleek and minimalist design for a very striking look and feel. The interior of the home is stylish and sophisticated with earthy tones and raw materials. The dining room features a long, wooden table, flanked by trendy grey chairs. 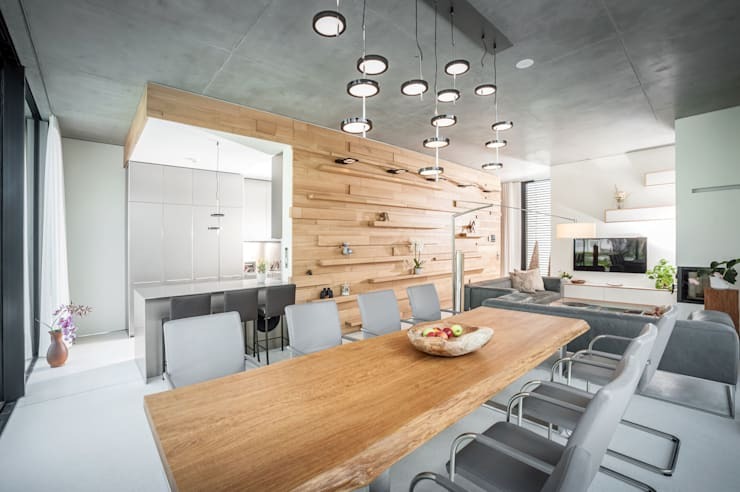 The cement ceiling and wooden cladding on the walls enhances this look and feel, creating a cocoon-like effect. Raw materials work wonderfully in modern homes and can be a more sustainable option too. Have a look at these tips for making your home roar with raw materials. The lights that hang over the dining room table are a great example of how trend and functionality collide. 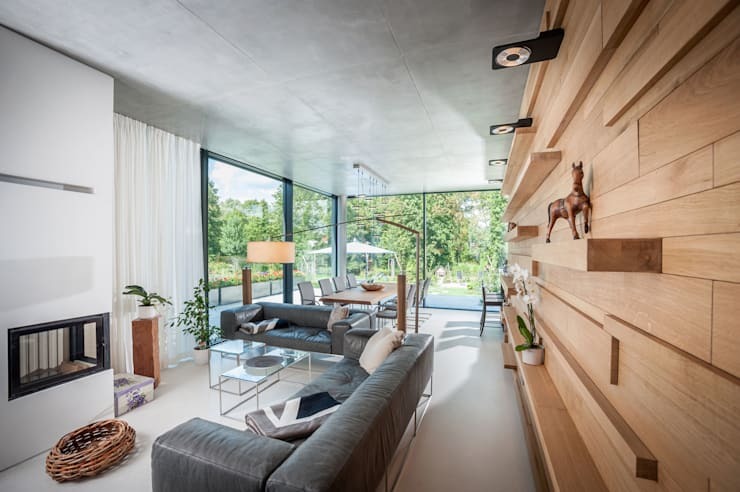 From this angle, we can see how the living areas flow between one another, creating a spacious and expansive interior. The designers installed large glass windows and doors through, allowing for a constant connection between the interior and exterior spaces. This also allows natural light and fresh air to flow through the interior space. The wooden wall on the one side of the living area features little niches and shelving, where carefully selected objects and decor elements have been put on display. These inject the area with some subtle charm and character, without overwhelming it. If we poke our heads into the television room, we come across a very funky room with white floors, white furniture and a white and orange wall! This room is slightly more casual and relaxed since it's a space where the homeowners can relax with a good book or watch a film. The designers could afford to have a little bit more fun creatively. 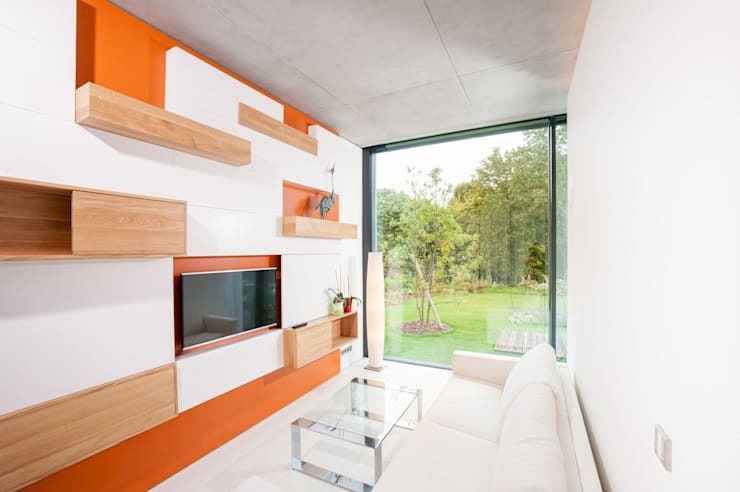 Thus they've introduced orange panels to the space, which bring in a subtle splash of colour and life to it. Don't you love how this area spills out onto the expansive garden? This home even features a study area, with panoramic views of the surrounds. In this area, we come across pot plants, which infuse the space with a touch of nature. Pot plants and vases of flowers are a wonderful way to add a subtle form of decor to an interior space. You'll also notice that there is plenty of storage space in this room, allowing files, papers and other items to be stored neatly out of sight. In a small space like this one, storage is key! 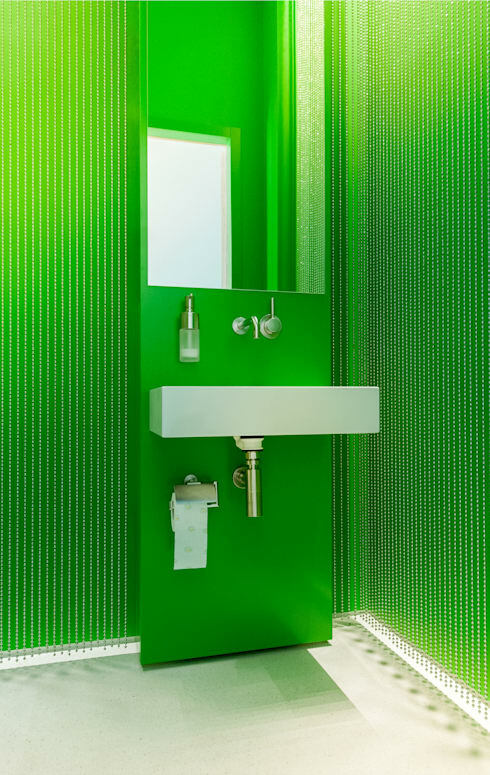 The bathroom is one of our favorite spaces in the house with its bright green walls. Have you ever seen something so unique? The green walls complement the modern, white features while making for a very trendy and charming bathroom area. Remember that your bathroom is where you get ready for the day so you want to feel refreshed and rejuvenated here. Green is a wonderful colour to inspire this! In fact, it's the colour of 2017. Have a look at these brilliant, beautiful bathroom trends for more inspiration on how to achieve a unique and modern bathroom. This bathroom is slightly more edgy and sophisticated compared to the other bathroom. It features charcoal tiles and sleek, white finishes. The designers could afford darker tones in this area because of how spacious it is. They've also installed soft lights throughout, creating a very bright and appealing space. You'll notice that there are niches in the wall, where personal items such as soaps and shampoos can be stored neatly away while still remaining accessible. This is a very innovative solution to storage! 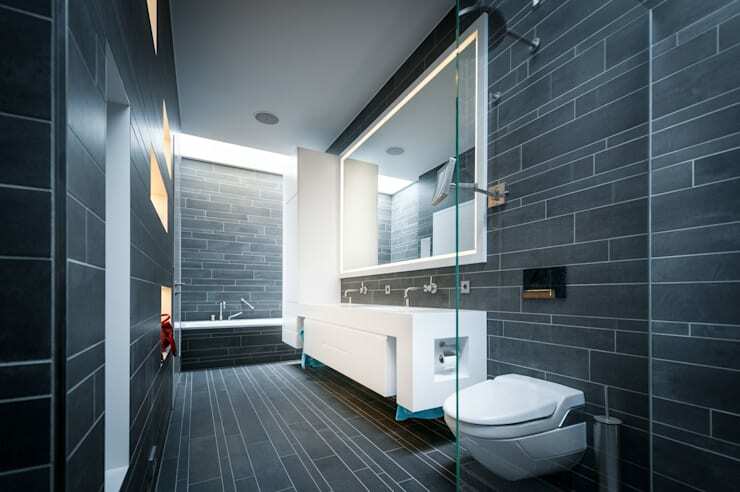 The large mirror above the basin adds to the feeling of space and depth. We end off our tour back outside the house, where we can see just how charming and appealing it is from the front. However, from this angle it is slightly more private and conservative. A double-garage neatly packages the exterior look and feel while the brick driveway provides this space with a functional and trendy area for visitor's cars to be parked. The little terrace on the left features gorgeous pot plants and flowers, which make for a very aesthetically appealing exterior space. If you've enjoyed exploring this home, you'll love this one too: This Eco-Friendly Home Soaks Up The Sun.